What to Do with the Doo Doo? Should we make a big stink about dog waste? The Citizen’s Committee for New York City sure thinks so. The organization has committed grant money towards composting stations that would turn New York City’s dog waste into a resource. According to the New York Post, there are 2 million dogs located in New York City producing about 275,000 tons of poop per year. This means that instead of being wasted in a landfill, the poop would be used as fertilizer for grass in multiple locations. The Citizen’s Committee for New York City was inspired by dog waste composting programs in Ithaca, New York and Cambridge, Massachusetts, where in one case the compost was used to produce electricity! The Citizen’s Committee for New York City is creatively dealing with a problem that plagues many New York City residents, what to do with the doo doo. The composting program is both innovative and advantageous to New Yorkers. The amount of poop sent off to landfills will be decreased, as well as the plastic baggies that are used to pick the poop up. 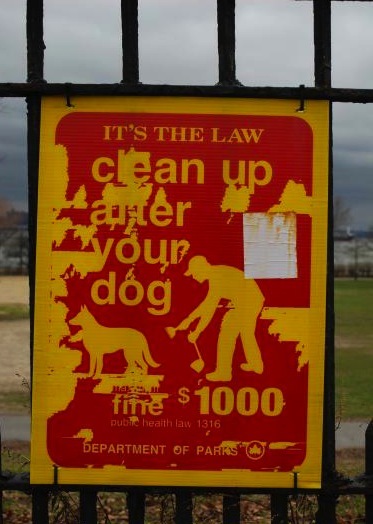 Dog waste left on NYC sidewalks is a common problem and poses health hazards. New York City passed the “Pooper Scooper Law” back in 1978, which proves difficult to enforce, as a police officer must be present at the scene of the crime. With any luck dog walkers will feel more inclined to scoop their dog’s poo, as it will now be a beneficial resource to the community. The Citizen’s Committee for New York City hopes to have some of the composting stations up and running by the end of the year. I had no idea Scooby’s Doo could be used for fertilizer. Thanks posting this information, it sounds like a fine idea. Carnivore waste can be used as fertilizer?